The needlework of the Peranakan Chinese is known mainly through their colourful beadwork but other forms of their embroidery were equally significant, bringing together heritage and innovation in the art. This article introduces readers to the range of their embroidery through a brief discussion of its history, cross-cultural elements, and a recent exhibition of nyonya needlework. Peranakan Museum, and Don Harper unless specified otherwise. In 1675, a Danish visitor to Banten in north-west Java noted that the Chinese women there made the “most beautiful pearl embroidery and needlework.” (Cortemünde, 1953). 350 years later, Peranakan Chinese beadwork and embroidery continue to captivate us. This article introduces readers to their needlework through a brief look at its history, cultural impact, and preservation. 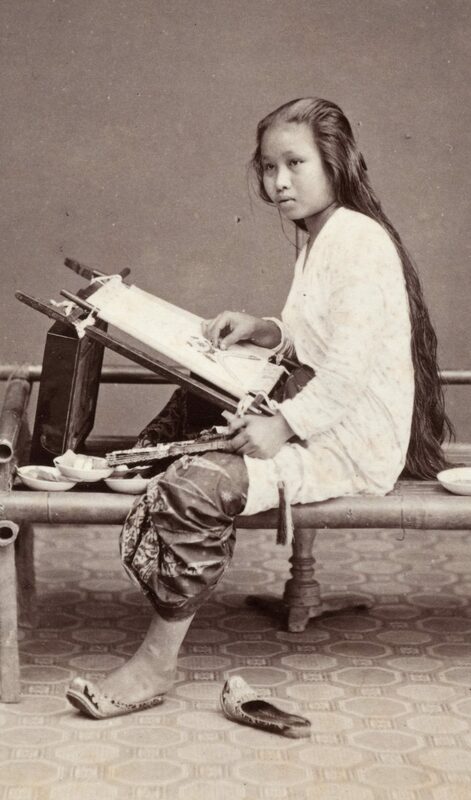 Few Chinese women migrated to island Southeast Asia until the second half of the nineteenth century, so the women Cortemünde (a ship’s doctor) described were probably Peranakan or “locally born” daughters of southern Chinese settlers and local women. Over time, small communities of Peranakan Chinese formed in trading towns like Malacca (Melaka) on the coast of Peninsular Malaysia, Palembang and Medan in Sumatra, and Batavia (Jakarta) and Semarang in Java. They maintained their Chinese names, beliefs, and traditions but adopted many local customs.1 Their vernacular was peppered with local terms, and ingredients like belacan (shrimp paste) lent their cuisine a distinct local character. While Peranakan Chinese men (the baba) retained their daily Chinese dress, Peranakan women (the nyonya; figure 1) wore the sarong (an untailored wrap skirt) and baju panjang (long blouse) or kebaya. Figure 1 An embroiderer. Woodbury and Page photographers, Java, 1870s. Albumen print. Collection Nationaal Museum van Wereldculturen. Coll.no. : TM-60003370. Their evolving identities manifest in their eclectic domestic interiors, dress, and material culture as they responded to their environments while forging a life under colonial (Dutch and British) rulers. Their needlework entwines a respect for their Chinese roots, an appreciation of craft, creativity, and a sense of the times and places in which they lived. With silk floss, gold threads and sequins, minute glass and metal beads, and peacock feathers, the nyonya crafted “exceedingly pretty” needlework with “great ingenuity, skill and originality.” (Vaughan,1879) They embroidered dress accessories (such as collars, cuffs, headdresses, shoulder-pieces, and purses) and furnishings (including valances for doorways and beds, pillow covers, tablecloths, bed covers, curtain ties, and even vases) for celebrations. Needlework slippers were significant items of the bride’s trousseau and as gifts to the groom’s family following Chinese traditions. Chinese auspicious symbols like dragons, phoenixes, deer, butterflies, rats, lotuses, and gourds dominate nyonya needlework. A multitude of motifs were often crammed together as if to maximise the blessings they conveyed (figure 2). Detailed and miniaturised, they give the works a delicate and refined feel. 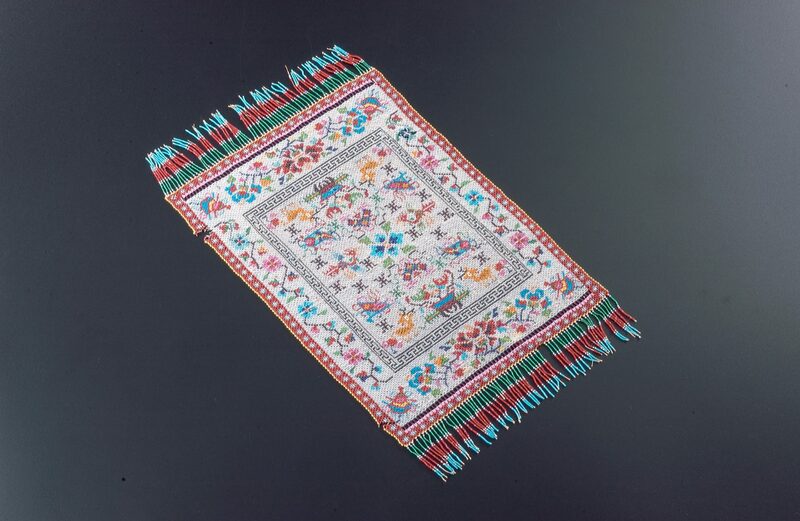 However, the motifs’ lack of proportion to each other and symmetrical arrangements often lend the designs a naïvety that distinguishes them from Chinese embroidery. 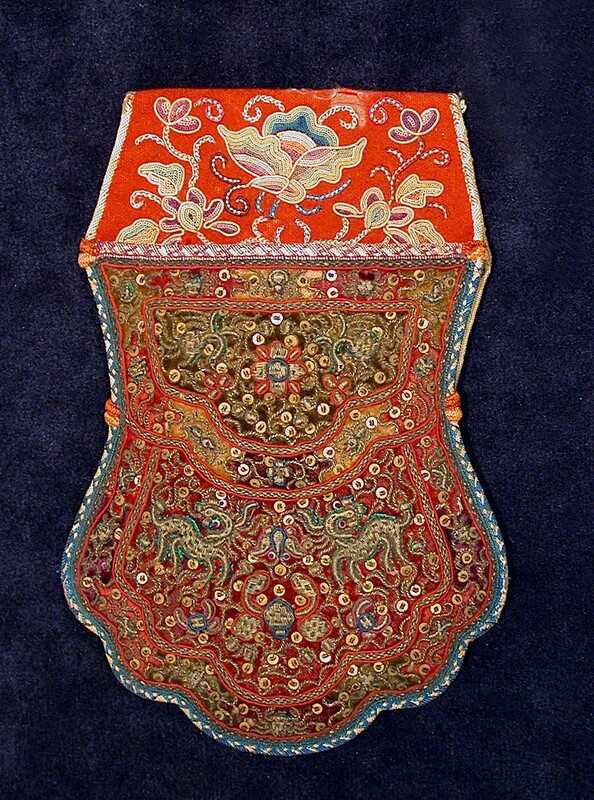 Figure 2 Woman’s belt purse embroidered with raised gold thread and silk thread. Malacca or Singapore, late 19th – early 20th century. Collection of Hall of the Pheonix and Peony, Singapore. Note the bright green peacock feathers around the two qilin and the needle woven edges of the purse. The reverse of the purse (not shown) is also densely embroidered with silk threads. Daoist mythical symbols and figures appear occasionally. A woman’s ceremonial handkerchief (figure 3) illustrates some charming interpretations. Instead of the usual thinning wisps of hair on either side of his high bald forehead, Shoulao, the God of Longevity, is given two protruding knots of hair that render him incongruously childlike. A grey horseshoe crab at the top of the handkerchief is recognisable by its spiky tail. In Chinese art, it represents marital bonds or filial piety (through the homonym hau in Hokkien). However, it is more aptly interpreted here through the local idioms where the horseshoe crab, known as mimi dan mintuno (which distinguishes male and female crabs) in Java or belangkas in Malay, connotes marital fidelity. In Malacca, where this piece may originate, the bride’s hairdo has a tail at the nape called buntut (tail) belangkas. 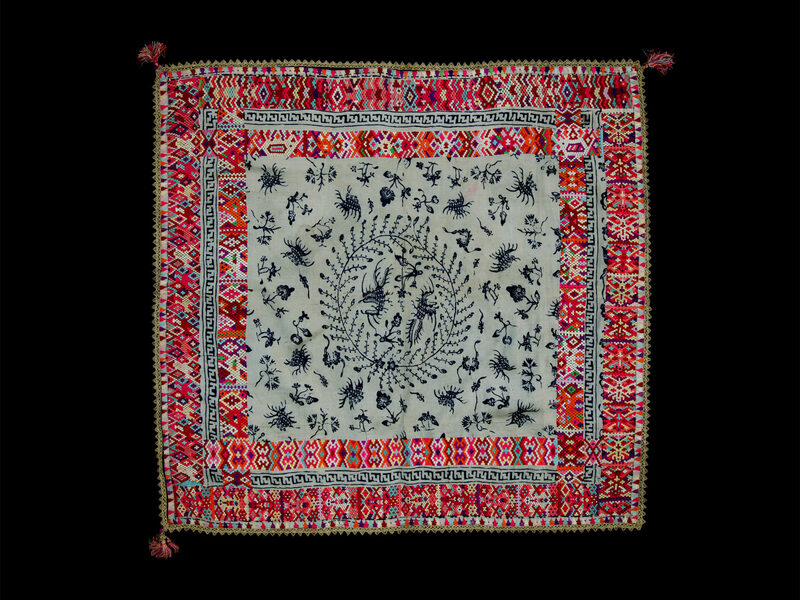 Figure 3 Woman’s ceremonial handkerchief embroidered with silk thread. Malacca or Singapore, late 19th century. Collection of the Asian Civilisations Museum, Singapore. 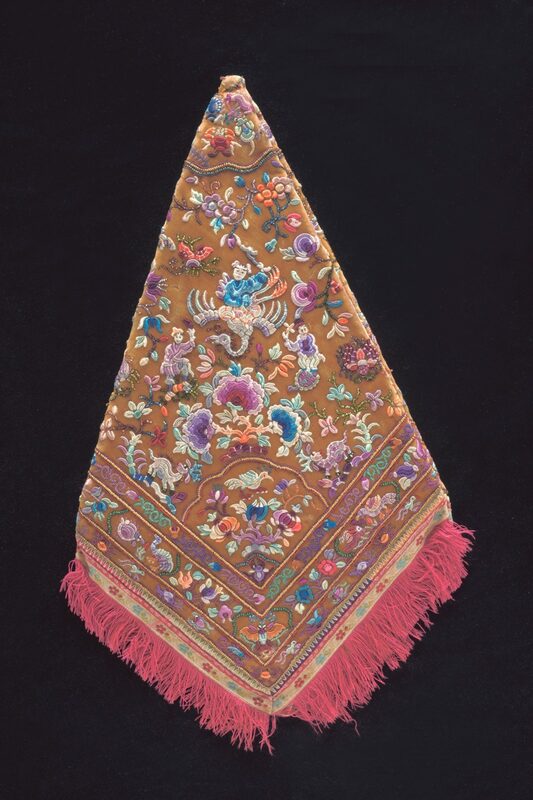 This type of handkerchief was used by women and girls with their ceremonial garments. It was suspended from a ring worn on the fourth finger. The embroidery has a padded appearance as the silk was stitched over tiny pieces of cardboard cut in the shapes of the figures. A beaded plaque made for a medical student at Cambridge University in 1896 by his mother or sisters in Penang is notable for the way in which the nyonya translated imagery. Here, the Emmanuel College crest with the figure of a rampant lion holding a wreath is recast as a Chinese lion. The transformation underscores the creative fluidity that underlies the richly layered identity of nyonya embroidery. Nyonya needlework combined elements inspired by diverse sources. 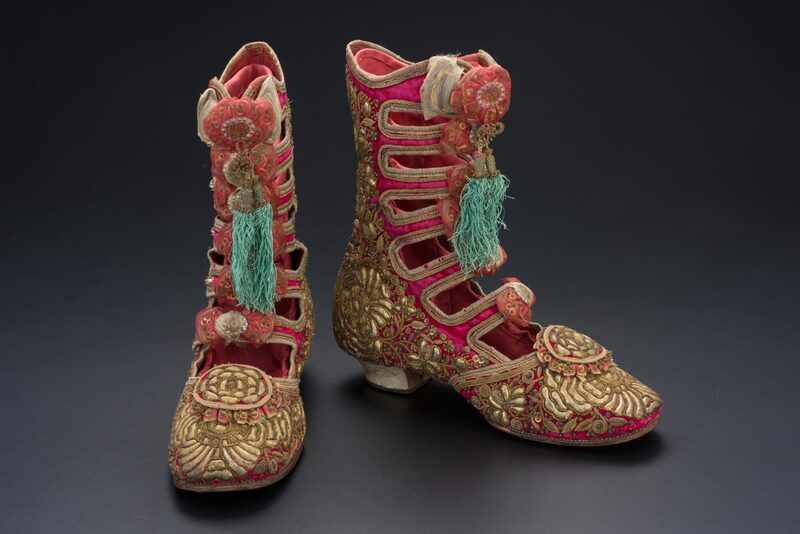 The nyonya’s embroidered boots were modelled on fashionable European ankle boots of the 1880s. Their raised gold embroidery (called tekat timbul in Malay) involved laying a flat gold thread or “gold plate” (known as kelingkam, from the Dutch word klinkant) over thick cord, a technique probably adapted from European ceremonial embroidery. Their dragon and floral designs are familiar Peranakan motifs rooted in Chinese art but often take on a local accent. In the boots illustrated (figure 4), the peonies are stiff and stylised like the Javanese renditions. Worn with a Chinese dress and skirt, boots like these bridged fashion and tradition, innovation and heritage. Figure 4 Pair of woman’s boots embroidered with raised gold thread. Java, late 19th century. Collection of the Peranakan Museum, Singapore. Gift of Mr. and Mrs. Lee Kip Lee. Women’s embroidered slippers shaped like a truncated “boat” may have been influenced partly by the form of Chinese straw slippers. Red velvet slippers with dainty gold embroidery, similar to the pair shown here (figure 5), were illustrated in a travel journal published in 1829. 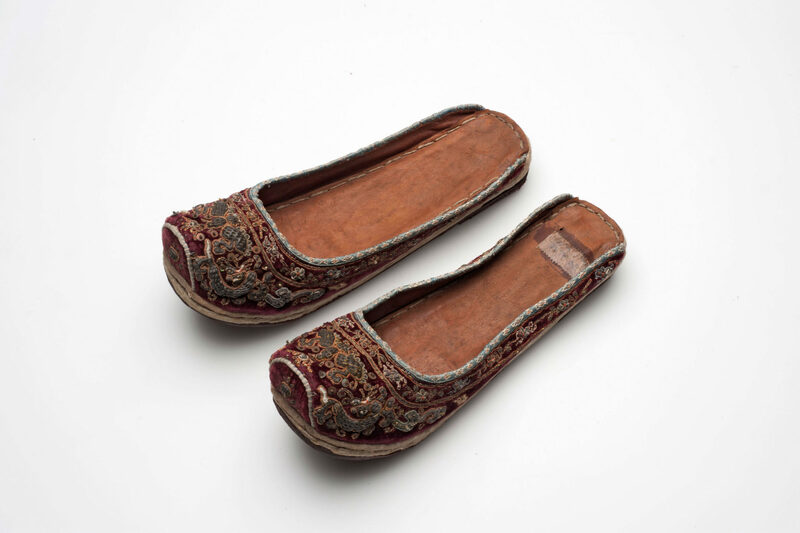 Although they are generally associated with the nyonya, the author notes that Javanese and Eurasian women, and in particular, nyai or concubines, also wore such footwear (Neueck, 1829). His account reminds us that nyonya needlework was not exclusive to the Peranakan Chinese but part of the broader material culture of luxury that resonated across communities. Figure 5 Woman’s slippers with raised gold thread embroidery. Indonesia, before 1887. Collection National Museum van Wereldculturen. Coll.no. : TM-A-7092.The basket pattern was widespread in nyonya gold embroideries (compare with figure 2) and is also employed in Malay needlework. Embroiderers found inspiration in textiles. Sometimes, they imitated batik designs or Chinese brocades in beads and thread. In other instances, they manipulated shared techniques to suit their particular aesthetic. On this handkerchief with an indigo batik design (figure 6) a starkly contrasting, boldly coloured openwork border has been laboriously added. Fine silk threads had to be removed before designs were darned into the remaining threads. Drawn thread embroideries (suji terawang) like this were also popular with Minangkabau people in the West Sumatran highlands, where they may have developed from European drawn work for household linens or from Islamic embroidery. Such overlaps highlight the shared craft traditions of neighbouring cultures. Figure 6 Panel of plaited beadwork. Penang, early 20th century. Collection of the Asian Civilisations Museum, Singapore. Panels like this might have been used as a cover for a pillow or side table. The Peranakan Chinese also made use of a type of beadwork that was netted or plaited, not stitched (figure 7). It is arguably the most complex of the nyonya “needlework” techniques as the structure is formed with multiple threads linked through tiny beads. Fringes may have been one of the inspirations for netted and plaited beadwork, as that was a frequent function of these pieces. The techniques have only recently been unraveled and although the impetus for nyonya plaited beadwork is unclear, certain variants have suggestive parallels with Chinese beadwork (Hector, 2016). Figure 7 Silk batik handkerchief embroidered with drawn work. West Sumatra, Indonesia, late 19th – early 20th century. Collection of Don Harper, Georgia, USA. A few examples of nyonya beadwork and embroidery bear Chinese text. The characters were sometimes illegible – perhaps some were inserted simply to reinforce the nyonya’s Chinese heritage. In the early twentieth century, formal education for girls was gradually accepted. English phrases like “Good Luck” filtered into needlework, reflecting changes in the way embroiderers communicated. Sewing lessons at school probably popularised designs like flower baskets. Books and children’s verses may have inspired embroidered images of puppies, kittens, and swans. From the mid 1930s, even Disney characters were beaded. After the early twentieth century, ceremonies were simplified and tastes in dress and decor changed. As a result, the social and symbolic importance of nyonya needlework, especially gold and silk embroideries, diminished. Fashion choices widened and, like the sarong and kebaya, nyonya beaded slippers were seldom worn. Few continued the craft after the middle of the twentieth century. As families quietly disposed of their embroidered artefacts, those with an eye for beauty began to collect them. Professor Ho Wing Meng’s richly-illustrated “collectors’ guides” published in the 1980s were pivotal in giving a voice to Peranakan decorative arts. His volume on beadwork and embroidery laid the foundation for collectors of the genre (Ho, 1987). At the same time, museums in Singapore and Malaysia started to exhibit Peranakan material culture, celebrating its “harmonious” cross-cultural aspect.3 When Singapore’s Peranakan Museum opened in 2008, its highlights included splendid examples of nyonya needlework, part of a national collection that had grown in breadth and depth over 30 years of dedicated collecting. In 2016, it held a special exhibition, “Nyonya Needlework: Beadwork and Embroidery in the Peranakan World”, that showcased the art as a diverse and innovative form of cultural and personal expression (Cheah, 2017). Figure 8 Installation view of the Nyonya Needlework exhibition at the Peranakan Museum, Singapore, June 2016–June 2017. Image courtesy of the Peranakan Museum. Exhibits were supplemented with private and institutional loans. Of particular note were a number of pieces lent by the National Museum of World Cultures in the Netherlands. They were acquired or accessioned in the 1870s and 1880s, considerably earlier than for other major collections of Peranakan artefacts. These “dateable” nineteenth century examples (for example, figure 5) showed the dynamism and diversity of needlework styles and the experimentation stimulated by the flow of ideas and things across the Peranakan world. While the exhibition brought a rich trove of historical nyonya beadwork and embroidery into the public eye, contemporary nyonya needlework was not addressed.4 As food for thought, what can we say about this craft today? When interest in Peranakan culture rekindled in the 1990s, a few people enthusiastically took up beadwork although silk thread and gold embroidery remains largely neglected.5 Old pieces are still emulated as a way of recovering forgotten techniques and to pay homage to the past. In doing so, contemporary nyonya needlework risks being straitjacketed by faithful reference to historical artefacts. But if the process of reconstructing techniques and designs also stimulates the embroiderers’ own creative imagination, then perhaps copying the past still has the potential to transform nyonya needlework into a living craft once again. The term Peranakan can also refer to other mixed-race or locally-born communities such as the Peranakan Indians and Jawi Peranakans (Indian Muslim Peranakans). In this article, Peranakan will refer to the Peranakan Chinese. 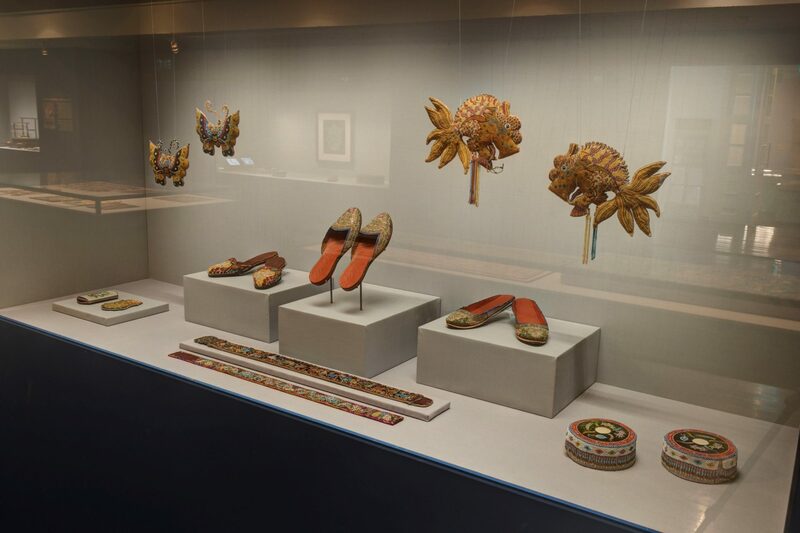 These were part of some 200 items of beadwork, originally thought to be Chinese, donated by an American collector of East Asian art in 1926 and 1936. While evidence for the Chinese production of nyonya (or nyonya-style) beadwork is scanty, the broader category of Chinese export of beadwork is discussed in Valerie Hector, “Mainland Chinese Export Beadwork,” Beads 29 (2017), pp. 59-75. Othman Mohd Yatim & Raiha Mohd Saud (1986). Warisan Baba dan Nyonya di Muzium Negara (p. 1). Kuala Lumpur: Muzium Negara. Yoong, Jackie (2008). Peranakan Art and Culture: A History of the Peranakan Museum, in Peranakan Museum Guide (pp. 16-17), by Randall Ee et al. Singapore: Asian Civilisations Museum.On the National Museum of Singapore’s beadwork and embroidery collection, see Eng-Lee, Seok Chee (1989). Festive Expressions: Nonya Beadwork and Embroidery. Singapore: National Museum. Singapore’s national collection can be searched on roots.sg. But it was acknowledged. A few contemporary works and a video with interviews of embroiderers were included in the educational space. The public programmes for the exhibition involved several local nyonya embroiderers. Bebe Seet from Singapore was one of the most influential. See Seet, Bebe (2009). Peranakan Beadwork: My Heritage. Singapore: Bebe Seet. Cheah, Hwei-Fen (2017). Nyonya Needlework. Singapore: Asian Civilisations Museum. Cortemünde, Johan Petri (1953). Dagbog fra en Ostindiefart, 1672-75 [Diary of a Voyage to the East Indies, 1672–75] (edited by Henning Henningsen) ( 133). Helsingør. Hector, Valerie (2016). Bead Netting and Plaiting Techniques in the Peranakan World. Beads 28, pp. 66-91. Ho, Wing Meng (1987). Straits Chinese Beadwork and Embroidery: A Collector’s Guide, Singapore: Times Books. Neueck, Pfyffer zu (1829). Skizzen von der Insel Java [Sketches of the Island of Java] (plate 13, pp. 33, 66). Schaffhausen: Franz Hurter. Vaughan, J. D. (1879). The Manners and Customs of the Chinese of the Straits Settlements (pp. 38-39). Singapore: Mission Press.